Is the new Core i5-4670K a worthy replacement for the i5-3570K? The Core i5-3570K was the best all-round gaming CPU. 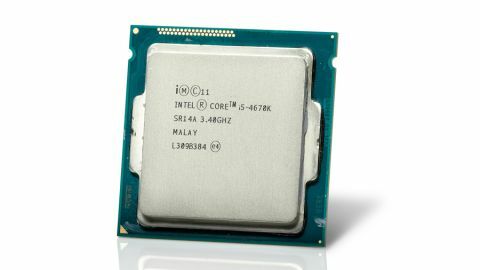 The i5-4670K is faster than the old 3570K, and only costs slightly more, so surely it's a worthy successor? Well, yes and no. Intel has been bigging up Haswell as a major new CPU design, and you'd expect that to mean significant improvements - actual tangible benefits - but there aren't really any to be had. There are even areas where the new chips might be worse than their predecessors. Let's start with the CPU cores themselves. Intel has applied what sounds like a pretty decent set of tweaks and mods, including better branch prediction, bigger data-level structures, more execution ports and some new floating point extensions. But on a clock-for-clock and core-for-core basis, the new cores turn out to be only very marginally better. That leaves only clockspeeds and core counts to give them a chance of achieving a tangible performance improvement. But the 4670K has the same 3.4GHz baseclock and 3.8GHz Turbo as the old 3570K, with the same quad-core layout, and 6MB of Intel Smart Cache. Overclocking is zero sum too. Our 4.5GHz top speed is a little less than we've generally seen from a 3570K. The only difference is that you're pretty much guaranteed to get that from a 3570K. Our sources in the chip channel tell us that the new Haswell models are much more variable in terms of the speeds you can achieve with retail chips, which means most gaming systems are likely to be sold with a conservative 4.2GHz overclock at best. We're not overly distracted by the new base clock strap Intel has exposed for the K series models, either. It gives a bit more flexibility, allowing you to hit some intermediate speeds you can't achieve with the CPU multiplier alone. Surely the 100MHz increments provided by the multiplier are good enough for everything bar bragging rights? Well, no. You just can't feel 50MHz in-game and it's not going to shave significant time off a video encode job. Intel has made a lot of noise about graphics, but it doesn't really affect the 4670K. Yes, it's a bit better than the old 3570K. You get 20 execution units as opposed to 16, but that's still half the number of the really interesting Iris and Iris Pro graphics cores that Intel is restricting to other Haswell chips. Nor do you get the 128MB of eDRAM that's exclusive to Iris Pro. In short, there's progress, but it's not enough to ultimately matter. All of which leaves us with Haswell's final innovation - improved battery life - but this is a desktop chip, so that doesn't apply. Better power consumption is always a good thing, but the savings are tiny for grid-connected appliances. There you have it. The new Intel Core i5-4670K enters the CPU charts as our new favourite all-round gaming CPU. And it's also a huge disappointment. So it goes.